Everything I find on this topic is related to CLI debugging, I am not doing CLI debugging. I am on Win 7 with Version 4.0.2 of PHPStorm. I assume I just have something configured incorrectly, but I have tried everything to fix it with no luck, and "the google" hasn't returned anything very helpful with this issue. You need to provide much more information: screenshots of your PhpStorm debugging settings; how you launch debugging etc -- maybe (just maybe) you are doing something wrong (e.g. in configuration or when initiating debug mode). Some simple screencast is much better than static screenshots or just plain text. 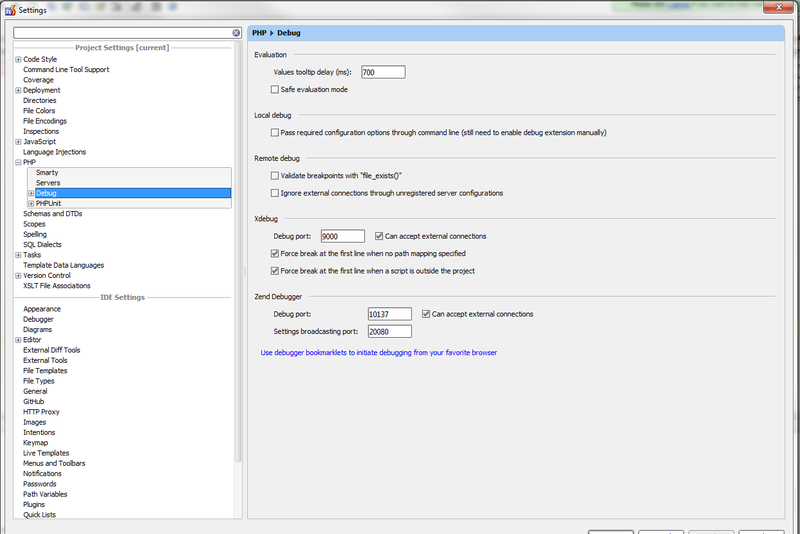 I have attached a screenshot of my settings. I am trying to use xdebug. 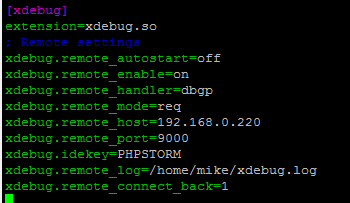 The php code sits on another machine than PHPStorm so I am making the remote connection. I have all the xdebug setting configured correctly(as far as I can tell), I have attached a screen shot of those settings in my php.ini. The IP is the IP of the machine with PHPstorm installed on it. Is there anything else you need to help with this issue? Those settings that you have shown are fine. How do you initiate debug session? What do you mean by "remote connection"? Are you trying to debug web page (on remote server) or some cli-script (on remote server)? Does debugging works fine if you debug local script (obviously, you need local php installation to check this)? In PHPStorm, I hit the green call button in the tool bar. Then over in chrome I turn on xdebug helper. I make sure to add a break point into my code, and refresh the page. This is when I get the error message in PHPStorm. I hope that's what you were looking for. PHPStorm and the PHP code are living on different machines. PHPStorm is at my desk and the code is on another server. LAN. It is actually a virtual machine running on the host machine, but they both have seperate IPs on the network. I`am not using a CLI debuging, trying to setup debuging for a localy stored projects. Found a soution that I need run this comannd in command promt export PHP_IDE_CONFIG="serverName=server_name" but there is no CLI in Denwer at all. Using Google Chome 19 Browser with Xdebug helper 1.0.1 extention that helps to start xdebug session. My suggestions for your team, It will be very usefull if It would be possible to install all pack for example Denwer + PHPStorm from one .exe, cause I found a lot of posts in Google with almost the same troubles. You are wrong in your assumption about me. How did you created "checker" server entry in "Settings | PHP | Servers" -- manually or PhpStorm helped you (dialogue poped up during first debug session)? What URL this site has? I ssume it's http://checker/somepage.php (or something like that -- actual page does not matter -- only host/domain name). Delete "checker" entry from "Settings | PHP | Servers"
Get rid of PHP_IDE_CONFIG="serverName=server_name" (may require restart, at least for PhpStorm itself and webserver). When PhpStorm accepts incomming debug connection, it will show you some dialog window asking for path mappings etc -- use it (in most cases, especially simple one, when there is no need to setup multiple mappings, it sets correct values automatically). 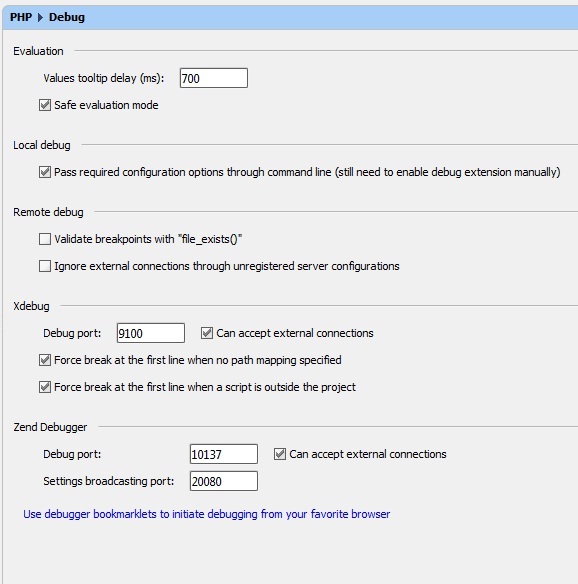 Interpreter is only required for running/debugging local PHP scripts/PHPUnit tests. It is not required for web-based debug (even if everything is on the same computer). Give me URL for Denwer to download -- I may try it myself later in virtual environment. OK -- no issues so far. Can you show screenshot of "Settings | PHP | Servers", please. I do not want to spam with possibly (likely) wrong ideas/suggestions if I cannot see all the details of the incomming request. The interesting sections are at the end: "Environment" and "PHP Variables"
Maybe one of those values are triggering such behaviour. I have replaced the name of my company with "website", the url is the url of the virtual machine. No new ideas so far -- will try Denwer later tonight. Are there any special things I need to do when setting it up (I mean -- to match your environment as close as possible) e.g. particular paths or config values? Can you share some info on what you have there? There is no special things to setup, common setup what will suggest installer for you just agree. Can you post your xdebug config as well, please. Any ideas after seeing my server configs? OK, I have installed Denwer with all defaults (had issues with encoding (since all text is in Russian and my system locale is English) + issues with editing hosts file & creating virtual drive (Denwer is NOT UAC friendly for sure). But since I know what may caused it, I found my way around. It took a while to figure out how Denwer works (there is no need to create new sites by editing config files -- just copy already made example and it does the rest on restart) .. but it's all in the past. So -- everything is set to their defaults (fresh install of PhpStorm as well -- easy to do in virtual environment). No other project or IDE configuration (at all). Activated "Start Listen to PHP Debug Connections"
That's it -- debugging works just fine. Don't know what may be wrong here on your side. Everything seems ok for me (at least from overhere). After this all worked fine. By the way in old project removed all server and debugging settings and leaved no settings, turned on Call button and it worked nice. I uninstalled PHPStorm 4.0.2 and installed the EAP version. I am still getting the exact same issue. Well .. another guy (Kirill) have solved such issue .. so I think it may be related to the actual xdebug config. But, TBH, I do not know what that can be. Maybe (just maybe) try getting rid of xdebug.remote_connect_back option (I saw one post (here on forum IIRC) that usage of this option + browser extension at the same time was causing the issue (unable to initiate debug session at all) -- it's different to what you have here (at least that's what I think), but maybe worth checking it out. Attempted both..no luck. Thanks for you help, I am going to submit a ticket now. Last idea (don't think this will do anything since Kirill has it from beginning) -- considering that message says "Cannot evaluate expression..." ... try ticking "Settings | PHP | Debug | Safe evaluation mode"
Finally I've found a cause of the issue - you have loaded your xdebug as extension, but it should be loaded as zend_extension (see - http://youtrack.jetbrains.com/issue/WI-11876#comment=27-354589). I'll improve the error message in the PhpStorm (it definitely should include some suggestions how to fix the issue). Hi guys, I have a similar problem.